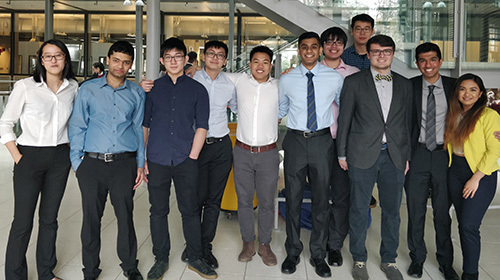 The Chem-E-Car team of the Albert Nerken School of Engineering are going to national Chem-E-Car Competition again this year after placing second in the regionals on April 8th. Their car, dubbed "Vitawin C," continues to improve on the citric-acid-based formula that pushed last year's car, Lemon Aid, to the nationals. The competition, which is sponsored by the American Institute of Chemical Engineers (AIChE) requires participants to devise a chemical reaction that not only moves a car forward, but also stops after a predetermined distance. While students are given a range of the required final distance—between 15 to 30 meters—specifics are not revealed until the day of the competition. When the distance is revealed, the team must adjust its calculations to ensure that the car would get as close to the specified point as possible.